»Exhilarating Hike To Dudhsagar Waterfalls! Exhilarating Hike To Dudhsagar Waterfalls! Everybody deserves a break from this fast pacing city life. And every now and then, we desire to go on an adventurous expedition. It cleanses and refreshes our minds, and we get a new zeal to our life. Getting this kind of break is just 9 hours away from Bangalore because Dudhsagar is the place you need to be! Nestled on the Western Ghats at the border of Karnataka and Goa, Dudhsagar is one of the highest waterfalls in India, flowing from the river Mandovi. It is about 560 km from Bangalore and just 29 km from Goa. This four-tiered waterfall drops from an altitude of 1017 ft! 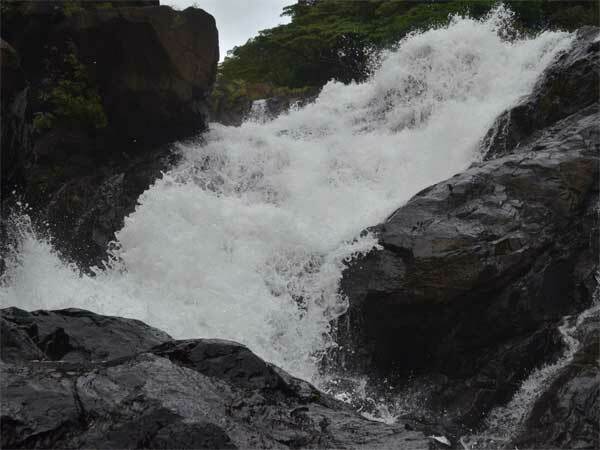 Dudhsagar literally translates to "Sea of Milk" and that describes the unerring view of the waterfall. This majestic fall is located in the Bhagwan Mahaveer Sanctuary and Mollem National Park, therefore, it is surrounded by rich forest thickets and natural resources. Dudhsagar is also every adventure buff's dream destination for trekking. The monsoon months of June to September are the best time to visit Dudhsagar as it is well-fed by the rains. But this is if you only wish to view the falls. If you want to visit the place for a trek, then post-monsoon months of October to February are ideal. Here are the other places to visit and things to do on your road trip to Dudhsagar. Madhugiri and Devarayanadurga are the two popular hills of Tumkur, and quickest getaway spots for trekking. Tumkur is located 70 km from Bangalore. Devarayandurga is a hill known for having a natural spring nearby called "Namada Chilume". To reach the summit of the hill, a well-defined trail carved with steps exists. There are 7 other gates with a marked trail, but amidst the overgrowth of shrubs, that lead to the peak. Madhugiri or "Honey Hills" can be entered through the doors of the fort that rests on the foothills. The trek might not be very easy since the climb gets steeper as you go up. The entire trek might take 3 hours but usually, depends on the trekker's expertise. Known for mainly being the land of Chola Dynasty's heritage, Chitradurga is one of Karnataka's famous tourist spot. Chitradurga Fort and Chandravalli Caves are the two most visited places. Built and expanded by many dynasties between the 17th and 18th century, Chitradurga Fort is a magnificent construction that houses citadels, warehouses, masjids and temples. The upper fort consists of 18 temples while the lower fort has one huge temple. Chandravalli Caves are known for housing a shivalinga, 80 ft below sea level. Chandravalli is surrounded with Kirabanakallu, Chitradurga and Cholagudda hills. The cave has a lake nearby, thus magnifying the mystic feel to the place. Located 60 km from Chitradurga, Davanagere was earlier known as the "Manchester Of India". This was due to the numerous cotton mills that came up in the city. It houses a number of temples and a 75 ft clock tower which is a major landmark of the city. Davanagere is mostly famous for their outstanding cuisine. Davanagere Benne Dosa is a lip-smacking, must-try dish that is so famous that it is found in many food outlets of Bangalore as well! 'Guladiki Unde' is a sweet dish, also famous here in Davanagere. Ranebennur Blackbuck Sanctuary is one of the very few sanctuaries in India that protects mainly blackbucks or "Krishna Mruga". It is located about 45 km from Davanagere. Apart from blackbucks, it also houses animals such as fox, pangolin, mongoose, to name a few. It is home to an endangered species of the Great Indian Bustard bird species as well. Haveri is a culturally rich temple town of Karnataka, located 35 km from Ranebennur. It reflects the artistry of Chola Dynasty through the architecture of its temples. Out of the galore of temples, Tarakeshwara temple is one wonderful structure built in the 12th century BC. However, this temple was built by the Kadambas and remarkable changes were made by the Chalukyas later. Dedicated to Lord Shiva, it is built in Hanagal town of Haveri. Siddheswara Temple and Galageswara Temple are two other beautiful temples that must be visited. Bankapura Peacock Sanctuary is found 21 km from Haveri. Due to a large number of peacocks and peahens found in this region, Government of India declared the region as a Peacock Sanctuary in 2006. Limited human interference in this region has helped peacocks multiply in number. More than a thousand peacocks are found here on a rough estimation! Therefore, any visitor who visits this place will definitely see a flock of peacocks. Located in Gotagodi of Shiggaon Taluk, Utsav Rock Garden is a sculpture garden that displays contemporary art of the rural culture and traditions of North Karnataka. The garden has over 2,000 sculptures depicting the daily life of labourers, which are very life-like. T.B. Solabakkanavar, the brain behind this magnificent garden, has won many awards for conceiving and designing this concept. The artwork of these sculptures is appealing to people of all ages. Previously known as Hubli, the name Hubballi literally translates to "flower creeper". Hubballi and Dharwad are the twin cities of Karnataka, that are referred together. Hubballi used to be a part of Dharwad, which was later separated into a city of its own. Some of the places of interest here are Unkal Lake, Chandramouleshwara Temple, Indira Gandhi Glass House Garden to name a few. Unkal Lake is a popular picnic site, with lush gardens surrounding it. Boating is available on the lake. A statue of Vivekananda is installed in the middle of this lake. Dandeli is situated about 50 km off-route from Tavargatti village. The town is a famous tourist spot because of the natural landscape in the place. It has thickets of forest areas all over the town and a river Kali that offers numerous water sports activities. Many local services offer adventure camping facilities along with nature walks and bird watching, depending on the chosen packages. White water rafting on river Kali is a popular sport, but this happens only when the water currents are high. October to March are the months to expect high currents in the water. Kayaking and canoeing are two other activities that are available at any time of the year. Dudhsagar Waterfalls is located inside the Bhagawan Mahaveer Sanctuary. So when you reach Dudhsagar, you inevitably have the chance of viewing this sanctuary. It is a home to many species of animals such as Barking Deer, Flying Squirrel, Slender Loris to name a few. The sanctuary also houses many bird species like Ruby-throated Yellow Bulbul, Three-toed Kingfisher, Emerald Dove, Golden Oriole and so much more! The entire region is, therefore, a haven to those who love dwelling in nature. The trek to Dudhsagar usually starts right from Castle Rock village, which is 14 km away. The entire trek will take at least 6-7 hours, therefore, it is best to start the trek early morning. Once you reach the peak of the waterfalls, you can come prepared to pitch a tent for the night. A campfire by the waterfall and you have yourself a priceless experience of a lifetime! You can take a look at the many local packages that are available for trekking and camping at Dudhsagar. These packages are inclusive of everything you need for the trek and camp such as sleeping bags, tents, etc. If you're not into trekking, then jeep safaris are also available. The safari usually begins at Collem. This journey of about one hour will take you through the Bhagawan Mahaveer Sanctuary, where you can view the wilderness, before reaching your destination.